Estelle Halper (1918–1980) lived and worked in New York City and Eastchester, New York until the end of her life. She was a staff instructor at the Westchester Art Workshop and founded the pottery program at the Hudson River Museum where she taught from 1956-1978. Her work was featured in group shows at The Metropolitan Museum of Art, The Everson Museum, The American Museum of Natural History, The Cooper Union Museum for the Arts of Decoration, and The Denver Museum. She had solo exhibits at America House (1951), the Hudson River Museum, the Silvermine Guild of Art, and the Philadelphia Art Alliance, as well as in many private galleries. Her work was sold through several NYC galleries including Georg Jensen and America House. Halper initially took ceramic classes at Greenwich House Pottery in Manhattan in the early 1940’s, when she and her husband, Louis, lived on University Place in Greenwich Village. Prior to that she was an expert seamstress/embroiderer and taught sewing classes at the Singer Sewing Company in New York. Influenced by the simplicity of the classic forms of Japanese, Chinese and Greek pottery, she initially based her designs on these classic forms, later developing her own personal approach to ceramics and design. She worked with stoneware clay, while sculptural works were made of stoneware with grog. All were fired to cone 10 in an electric kiln. 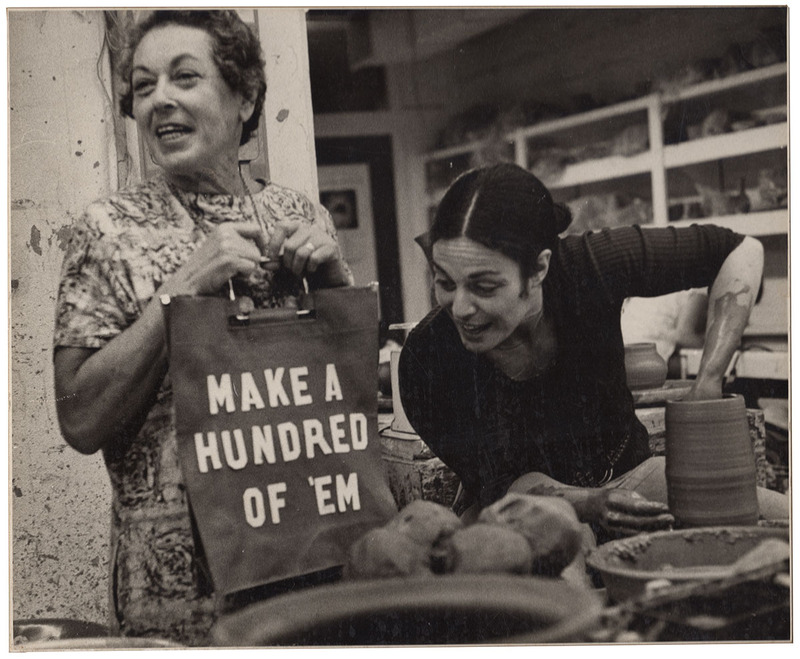 She experimented with various clay bodies and mixed her own clay in a pug mill in her studio in Eastchester, New York. Best known for her volcanic turquoise and blue glazes, these were developed while experimenting in her studio in the early 1950’s. During the 1950’s her style became more eclectic, integrating classic forms with her unique manner of expressing emotion through innovative ceramic design. Many of her sculptural forms were inspired by nature – gourds, pods, sea forms and vegetation - which led her to dramatically alter her ceramic forms while evolving a more sculptural and abstract approach to her pottery. Further, Halper’s expressive use of glazes on plates and vessels reflects the influence of the Abstract Expressionists on her work. Their visions nourished her love of color fused with the expression of intense emotions. In her work, she focused on seeing the Beauty in life forms and coordinating form and design with an underlining harmony of color to deepen the emotional impact of each piece.